JOHNSTOWN, PA, May 2, 2016—The United States Army’s Interactive Semi tractor trailer and military robots will be at the Greater Johnstown Career & Technology Center, located at 445 Schoolhouse Road in Richland Township, on Monday, May 9. This is a free event to strengthen Science, Technology, Engineering, and Mathematics (STEM)-related programs that inspire current and future generations of young people to pursue careers in these fields. All school districts that participate in the GJCTC are invited to attend to learn the importance that the STEM initiative holds for their future. Students will be able to explore interactive gaming and navigating the robots. The event is scheduled in two timeslots: students from 8:00 am to 2:00 pm, and the public from 2:00 pm to 4:00 pm. Area employers will also be in attendance to discuss with the students their own companies’ needs for employees training in STEM-specific areas, and will share information regarding local job options and opportunities in the STEM fields of study that are relevant to their own businesses. 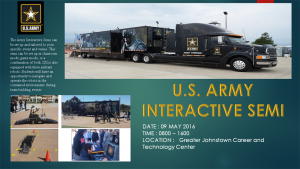 The event is presented in partnership with the United States Army, The PA CareerLink® Cambria County/Goodwill of the Southern Alleghenies, Greater Johnstown Career & Technology Center, and the Workforce Innovation & Opportunity Act (WIOA) Youth Staff (funded through the Southern Alleghenies Workforce Development Board). For more information, contact the PA CareerLink Cambria County at (814) 533-2493.